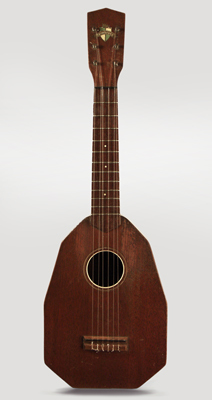 Favilla Wimbrola Model Concert Ukulele, c. 1930, made in New York City, natural mahogany finish, mahogany body and neck, original black chipboard case. Made by New York's Favilla Bros. to the design of American singer/writer Dale Wimbrow, the Wimbrola is a truly unique member of the ukulele family. The 6 strings are tuned to standard uke tuning with the first and third courses are doubled-oddly enough they are all evenly spaced at the bridge! The body is unusual as well, with 9 sides and no waist. Favilla ukes generally are well made, excellent sounding instruments and this is no exception. A very cool and unique creation. Overall length is 23 1/4 in. (59.1 cm. ), 7 1/2 in. (19 cm.) width, and 2 5/8 in. (6.7 cm.) in depth at side, taken at the end block. Scale length is 15 in. (381 mm.). Width of nut is 1 7/16 in. (36 mm.). All original with a decent amount of wear overall, and some heavier strumwear into the wood to the top around the fingerboard, and some light ruts to the board itsel. A good player, no repairs or damage beyond quite a bit of play. Very good sounding; comes with a period generic (not fitted to the unusual body shape) SSC. Very Good + Condition.